“We wanted to provide a platform for MRC WIMM postdocs to get together, get to know each other, find out about each others projects and build a network of peer support” explained the organising committee. With these aims in mind, the day was structured to include both scientific and social sessions. There were two scientific sessions: one featuring more advanced projects while another giving the opportunity for more preliminary research to be presented. There was also a chance for flash talks, followed by a poster session. The scientific session were intercalated with networking opportunities, from a scientific speed-dating event to a drinks reception and pizza at the end of the day. Acknowledging the diverse paths open to researchers, the symposium also included a careers session, covering the benefits of public engagement and different opportunities within industry. The keynote speaker was Prof Peter Lawrence from Cambridge University. 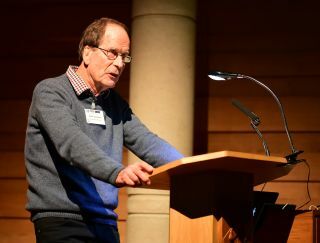 His talk entitled ‘What my mentors taught me about doing research’ was a fascinating insight into his long career and the inspiring mentors that he encountered, from V.B Wigglesworth to Sydney Brenner and Francis Crick. Prof Lawrence reminded our postdocs of the importance of choosing a scientific problem carefully and also of taking risks, even in the current publication and grant climate. He advised the audience to value curiosity and also the unique combination of qualities that each of us possess- and how these can be complemented by others via fruitful collaborations. 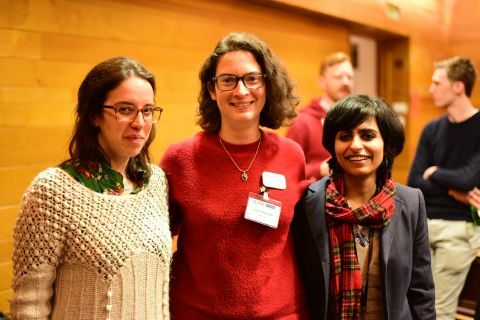 The MRC WIMM postdoc symposium took place at Wolfson College on the 25th of January 2019. It was organised by Dr Lise Chauveau (Rehwinkel group), Dr Christina Rode (de Bruijn group), Dr Mafalda Santos (Davis group) and Dr Koshika Yadava (Ogg group). The meeting included wide participation from across the institute, including facilities and administration staff. The meeting was sponsored by Qiagen, Greiner Bio-One, Anachem, Proteintech, BenchSci and Genomics plc.